Centre House is not just a place to stay, but a way to a better place. Centre House provides shelter and food to clients who are experiencing homelessness or in crisis, but also guidance to reach a more stable housing future. Residents must be over the age of 18 unless accompanied by a parent or legal guardian, or legally emancipated. The Centre House shelter is staffed 24 hours a day 7 days a week. There is no charge to stay at Centre House. 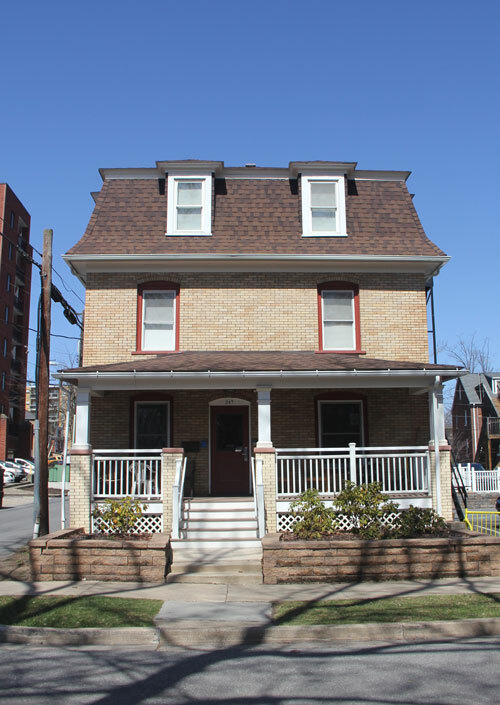 Our philosophy is that housing issues and basic needs emergencies result from a variety of personal crises and a lack of intervention resources. Housing Transitions seeks to provide effective services that promote positive change for those willing to accept the challenges and opportunities necessary to achieve a more independent and self-sufficient lifestyle. Residents are provided with all necessary toiletries and linens, including towels, bedding, and personal items. Residents have 24/7 access to Housing Case Managers who help identify needs and meet goals through clear plans and concrete steps. Residents are responsible for daily housekeeping chores to help keep the shelter running efficiently. Residents have their own mailbox during their stay at Centre House. Residents may clean clothing in the in house washer and dryer. All adult clients complete an interview process prior to determination of eligibility. Individuals convicted of or charged with a violent crime, a crime of a sexual nature, or a crime involving the sale or distribution of drugs are not deemed eligible for residential services. The shelter focuses on accommodating Centre County residents. The shelter does not provide financial assistance. However, the Case Manager assists residents with calls to other agencies, churches, etc. to put together a package for first month rent and/or security deposit, medication, or other substantial needs. Each resident is expected to follow all Centre House rules and to work with the Centre House Case Manager daily. Formal warning may be issued to residents who do not comply with requirements of the program, and dismissal may occur if a client is in repeated violation of rules, refuses to work with the staff, or breaks a rule for which immediate exit is required. Use of drugs, alcohol, or illegal substances while staying at the shelter is strictly prohibited. Lewd, aggressive, promiscuous behavior and/or language, discriminatory slurs or not returning to the shelter by 11p.m. without notice to staff may result in immediate exit from the program. The Case Manager will provide the resources or referral for services in order to be successful in this program and find stable housing upon exit. The shelter provides a phone for residents to use to make employment and housing calls. It's hard to describe a typical month because case managers work with each client on an individual basis. We will work with you to access the resources you need to get on your feet. If we don’t know the right resources, we know the people who do. Our in-house case managers work with your current case managers to address your needs. Housing Transitions is designed to relieve the stress while you are in crisis. While living in a secure, safe shelter, you can take time to focus on acquiring resources that will help you find sustainable and permanent solutions for the future, like help finding work, getting a car or attending job training classes. When you first arrive at Centre House, there will be an extended interview to help us learn about the factors affecting your ability to find and keep permanent housing. Next we will help you identify goals and what steps to take to meet them. You’ll spend the first few days adjusting to life at the shelter. Everyone is up by 8 or 9am (depending on work schedule) and is home by 9pm to participate in Life Skills Training. Dinner is prepared. Lunch and breakfast can be prepared on your own time with the food we provide in our kitchen. A firm schedule, overseen by our in-house staff, helps you structure your time and focus to gear up for the big tasks in the coming weeks. By Week 2, you will have a regular routine that helps you start meeting your goals. We can even help you get tasks done. For example, filing claims and getting health information and records you need can be a full time job. While you look for work or go to your job, the staff can make exploratory phone calls and help file claims and get information. Your case manager will meet with you every few days to check on your progress. Your Case Manager will be able to connect you to more resources and potential benefits that you may not know about, or did not have the time to apply for before. The second week builds the important momentum to start the search process for housing options. It is also important in this week and the third week to save your income for the first deposit and rent. By week 3, your personal plan is up and running! You’re working with our Housing Case Managers and following up on housing leads and options for you and your dependents. You’re also following up on job applications and continuing to revise your new resume. You’ve let some of those dreams develop and you’re identifying new tasks you need to accomplish to meet your goals. Maybe you start attending community job skills training this week. Maybe you’re able to confirm viable health insurance options or found mental health support you’ve needed. There’s even a chance that you’re already on your feet and ready to go. Not everyone who stays with us will stay for a month. A few days may be all you need and you’re on your way. By the end of week four, you may be ready to move into long-term housing. Even after you leave Centre House, you retain access to the Housing Case Managers and other resources we offer you. This plan is just that: a plan. Your time at the shelter will be a deeply personal process. Each individual and family has an unique experience in the shelter and receives the help and support they need to tackle their unique set of problems. Sometimes our clients only need a few days to breathe and make a plan with the support of our staff to find their feet again. Sometimes, a month is not enough even when you’ve done all the work you need to do. We evaluate each case before encouraging you to take the next step into long-term housing.